A steep trail provides access to stunning vistas at a price. Mt. 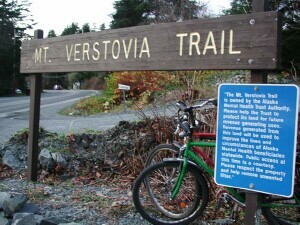 Verstovia is easily the most strenuous of the maintained trails in Sitka, but it is still quite popular in all seasons. Drive out Sawmill Creek Boulevard a couple of miles. There is a large trailhead sign along (most easily visible when driving back into town). The trail starts beside a building that is currently home to Vista Del Mar Restaurant. Views of Sitka, Sitka Sound, and the mountains of Baranof Island.